Among the choirs of athletes, he is a conspicuous star. 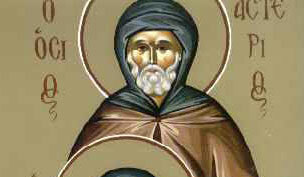 The Venerable Martyr Asterios the Senator lived during the reign of the pagan emperors Valerian (253-259) and his son Gallienus (260-268). Although he was a Roman senator, Asterios nonetheless held firmly to the Christian faith, in spite of the persecutions occurring during those times. Once, while in Palestine, he came to the city of Caesarea Philippi, where by custom a pagan feast was made with the offering of sacrifice to an idol. The demon residing in the idol made the sacrifice disappear, and this was looked upon as a great wonder. Saint Asterios expelled the demon by prayer, the sacrifice ceased to be invisible, and the pagans ceased to celebrate this impious festival. Saint Asterios also happened to be present at the sufferings of the Martyr Marinos (Dec. 16). When the execution was over, he took off his senatorial garb, spread it upon the ground and wrapped the head and body of Saint Marinos in it. On his own shoulders he carried the martyr’s relics to the grave and reverently consigned them to earth. For doing this, he was himself sentenced to death and beheaded in the year 260.